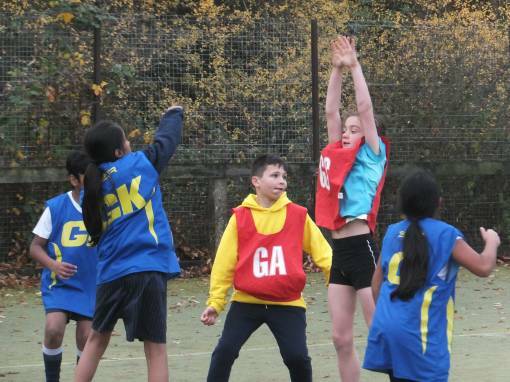 Hillview, Queensway, Hanwell Fields, Bishop Loveday, St. Joseph’s, The Grange, Cropredy and Harriers played in the Y5/6 Banbury Area netball tournament on Thursday 15th November. The event was held at Wykham Park Academy with Young Leaders from the Academy umpiring the matches. The 8 teams all played each other in a round robin tournament across 7 rounds. The children did brilliantly, making so much progress throughout the morning both with their skills and confidence. All the practise that St. Joseph’s put in paid off as they proved to be unbeatable, winning all of their matches and taking the top spot. The Grange were also very strong, winning all of their matches apart from against St. Joseph’s, they came 2nd. Both these teams had clearly been practising their shooting as they scored 20 (St. Joseph’s) and 18 (The Grange) goals over the course of the morning (and only conceded one goal each!). Hillview were 3rd, Cropredy 4th, Harriers 5th, Hanwell Fields 6th, Queensway 7th and Bishop Loveday 8th. St. Joseph’s, The Grange, Hillview and Cropredy have qualified for the partnership finals in March….good luck! All the children took the School Games Value of Respect fully on board, making sure they listened carefully to the umpires, their teachers and each other and thanking everyone at the end of their matches. Each school nominated one child to receive a special Respect certificate at the end of the morning, well done to all these children.